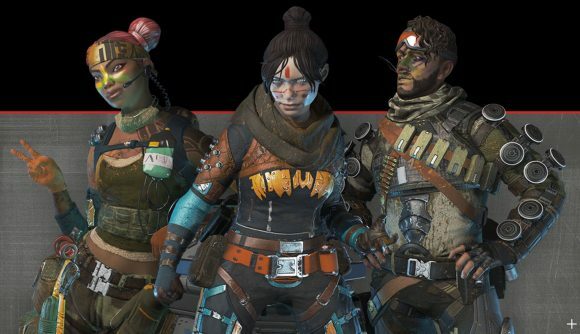 Apex Legends’ battle pass is out tomorrow, and publisher EA has revealed its contents in full. The highlights include new skins for Lifeline, Wraith, and Mirage; dozens of new weapon skins including a gorgeous ‘evolving’ skin for the Havoc energy rifle at tier 100; and free rewards for everyone who plays during season one. The battle pass is named Wild Frontier and looks themed around the rugged outdoors, with the new Legend skins mainly in earthy greens and browns (see featured image). It’s not quite as colourful as Fortnite’s current season of dragons and volcanoes, but then, nor is Apex Legends itself. The free rewards include one Wild Frontier Legend skin and 18 Wild Frontier stat trackers, which presumably can be redeemed on any applicable Legend or item. You can also grab five Apex Packs – loot boxes which can drop random cosmetics, or the materials to craft those of your choosing. Anyone can earn these items for free by playing over the course of the season, irrespective of whether you’ve bought the battle pass. The battle pass itself contains 100 tiers of further cosmetic rewards, culminating in a lovely silver-blue design for the Havoc energy rifle at tier 100. Apparently, this skin will ‘evolve’ as you score kills with it, gaining glowing red eyes and smoking nostrils. Nonetheless, reaction on Reddit has been mixed given that the Havoc isn’t all that popular – some players are calling for an evolving Peacekeeper skin instead, which seems much more in keeping with the meta so far. Head over to EA’s blog here for a full rundown of all 100 tiers and their rewards, plus a handy FAQ. The battle pass will cost you 950 Apex Coins (roughly $9.50), though you can get the pass plus its first 25 levels if you’re okay with splashing out 2,800 Coins. In a nice, consumer-friendly twist, the battle pass tiers include bonus Apex Coins – community manager Jay Frechette explains that these bonus coins total 1,000. In other words: play enough this season, and you don’t have to spend any (more) real money on the season two pass, assuming its price doesn’t change. It looks like the final coin drop in the Wild Frontier pass is at tier 97, though, so expect a hefty grind.